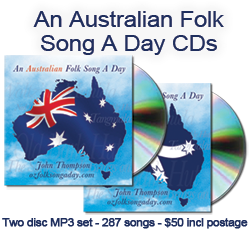 A daily posting of Australian folk songs - 26 January, 2011 to 26 January, 2012. Check out the Blog Archive for a full listing. For she knows what she's about. But", says Poll, "I can give you some nice ginger beer,"
And she adds, "do you see any green in my eye? To get up in the morning early." This tune from the Joy Durst Memorial Song Collection. And down the mill meadows has taken his wayTo hawk—and pray where's the harm? And Philip, they say, has a musical tongue. And Philip he always is hawking there! Should be trained in the morning early. And then a long leave-taking over the stile. For maidens, they say, do not always say " Nay"
When they're asked in the morning early. He sought o'er the hills, through the valleys and fieldFor comfort his spirits to cheer. Now they both had long loved, when they thought they "
" Shall we talk of our wedding just down by the stile ?" She blushed, turned away, but she didn't say " Nay,"
So they married one morning early. ...and thanks for the original. 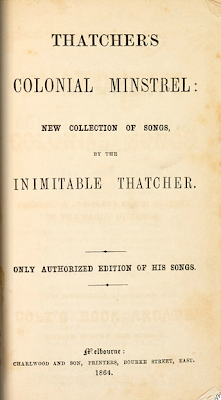 This blog was inspired by John Boden's "Folk Song A Day" blog, featuring mostly unaccompanied renditions of English folk songs. I thought that Australia Day was a good time to start an Australian version*. 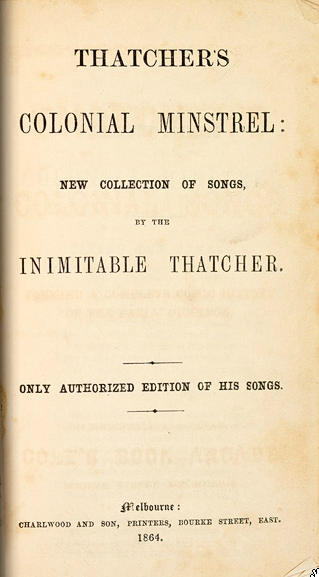 While some of the songs will be previously-recorded songs, most will be recorded for this blog. I plan to use a variety of arrangement styles and recording approaches. While I will attempt to record versions of these songs which are pleasant to listen to, this is more of an archiving project than a recording venture. I'm hoping that this will be a site where new and old songs can be gathered and where the visitors to the site will share in the rich history and texture of the lovely conglomeration that is Australian traditional song. *Australia Day is January 26. My blog accounts time was set to UK time when I started the blog. This explains why the first entry is now marked January 27. Changing the time in February is also the reason there are 29 entries for February. You can't have too much of a good thing! John Thompson has toured internationally with Nicole Murray as cloudstreet. He has performed on stages around the world for over 30 years. In his former life as a criminal-law barrister, John dazzled and amazed with his tales of high fiction. As part of the comedy duo, Never the Twain, John hosted the Variety Breakfast at over 10 Woodford Folk Festivals, with a stellar array of guests, including former Australian Prime Minister, Bob Hawke (who was persuaded to lead the crowd in a chorus of Solidarity Forever). John has lead teams to victory in many Woodford Great Debates. He maintains an active interest in politics, current events and the absurd. And he sings. John has served on the committee of the Queensland Folk Federation and as president of Folk Alliance Australia. He has served as the co-ordinator of the Maleny Celtic Winter School and the Brisbane Folk History Project, and is currently performing the role of the Song Man in the Australian production of the National Theatre of Great Britain's War Horse.